Ask someone of South-Asian origin what “biryani” means to them, and they will tell you that it is so much more than a tantalising rice dish. For many of us, biryani is a sentimental part of our childhood, and for generations, it has been a symbol of jubilation and festivity. It is a dish that is forged from the love, toil, and might of our mothers, and often served to mark a special occasion, the arrival of an important guest, or to celebrate the fact that we scored 20 out of 10 on our maths test – (and believe me, if we didn’t find a way to make that mathematically possible, we’d get a good kicking instead). For many of us, biryani is the meaning of life itself, and yet, in Indian restaurants across the country, biryani often takes a back seat on the menu – lurking at the bottom of the “Mains” section, or shifted out altogether to an undermining list of “sides”. 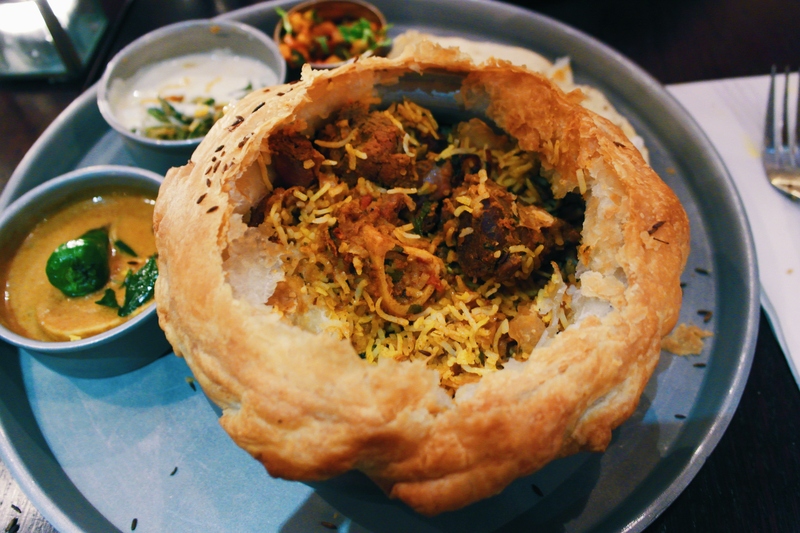 No longer able to tolerate this outrage, chef Dhruv Mittal made it his mission to bring the Hyderabadi biryani back into the limelight, and in doing so, created DUM, a dedicated Biryani House buried below the streets of Soho. Curious to see whether his burly hands could possess the delicacy of a mother’s touch, we headed on down to see just how good his biryani could be. 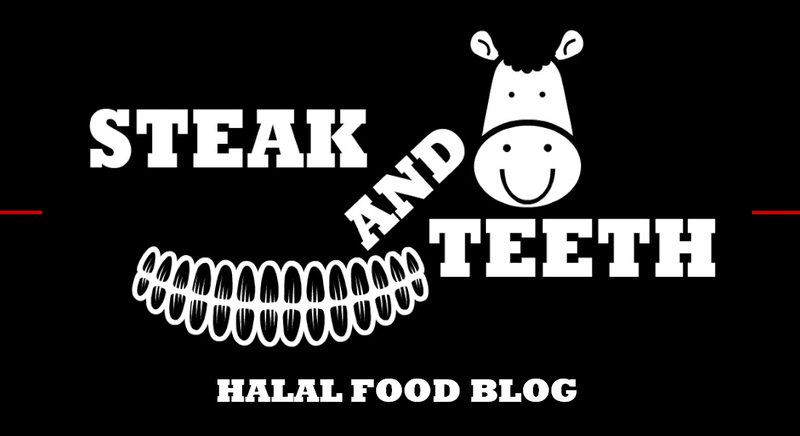 Note: All the meat used is halal. Alcohol is served on the premises. 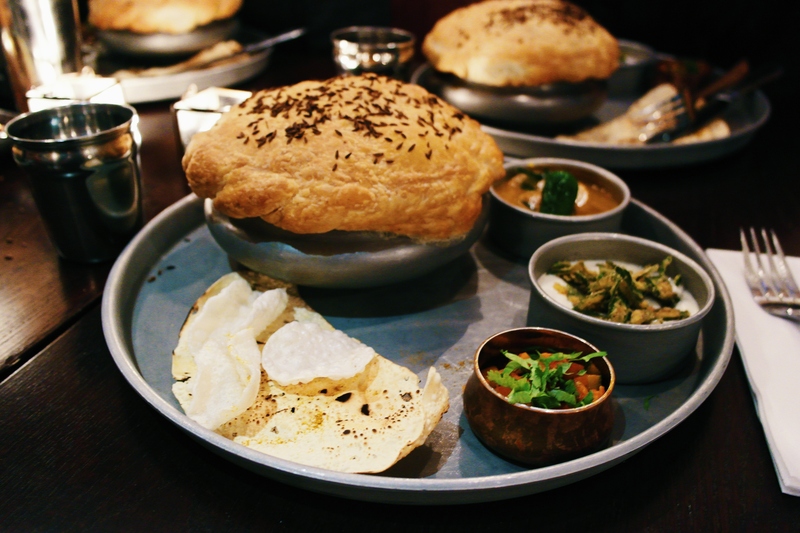 In keeping with DUM’s specialised nature, the menu revolves around three principle biryanis: lamb shank, chicken, and the wrong choice (vegetarian). You can also expect to find a handful of starters – or “snacks”, which surprisingly, deserve to be recognised in their own right. 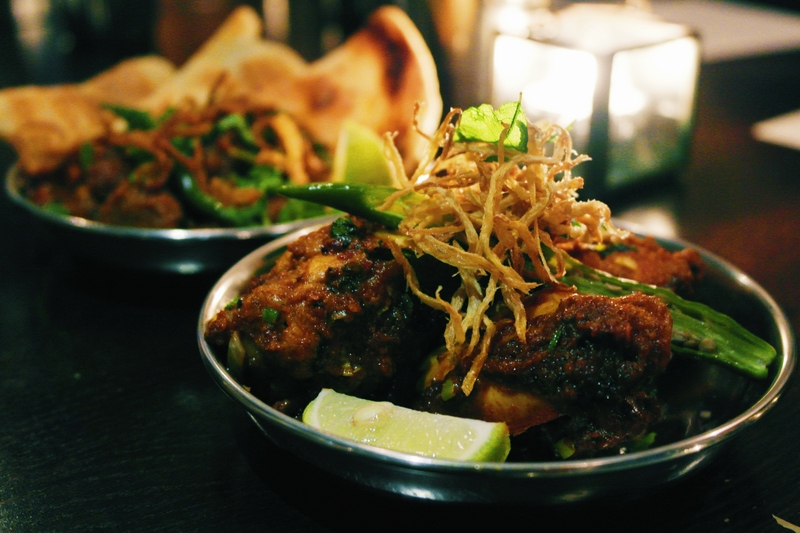 First to be devoured was a plate of Kodi Vepudu – tender chicken wings covered in a hot and sour masala. The succulent chicken was quick to fall off the bone, and as it did, it melted in the mouth to reveal a deep set of rich and layered flavours. With its ferociously spicy kick and exquisitely sharp zest, it was an instant hit with both myself and The Terminator, and served as a perfect start to the meal. The Andhra mutton fry was equally endearing, as the tender mutton chunks delivered a rich and homely set of flavours that paired perfectly with the soft but crispy paratha. I also “commandeered” a bite of Napoleon’s Andhra prawn fry (not pictured), and here too I was greeted by a deeply-seated assortment of spices. What’s more, the prawns themselves had been perfectly cooked, and possessed a thick and moist texture that simply could not be faulted. Choosing a main course had proved to be a fairly straightforward decision on my part, and I sat in silent glee as my pastry-sealed bowl of lamb shank biryani was placed before me. Taking a fork into my right hand, I proudly demonstrated the surgical finesse I had picked up after five years of dental school, by mercilessly battering through the crisp and buttery dome of pastry. 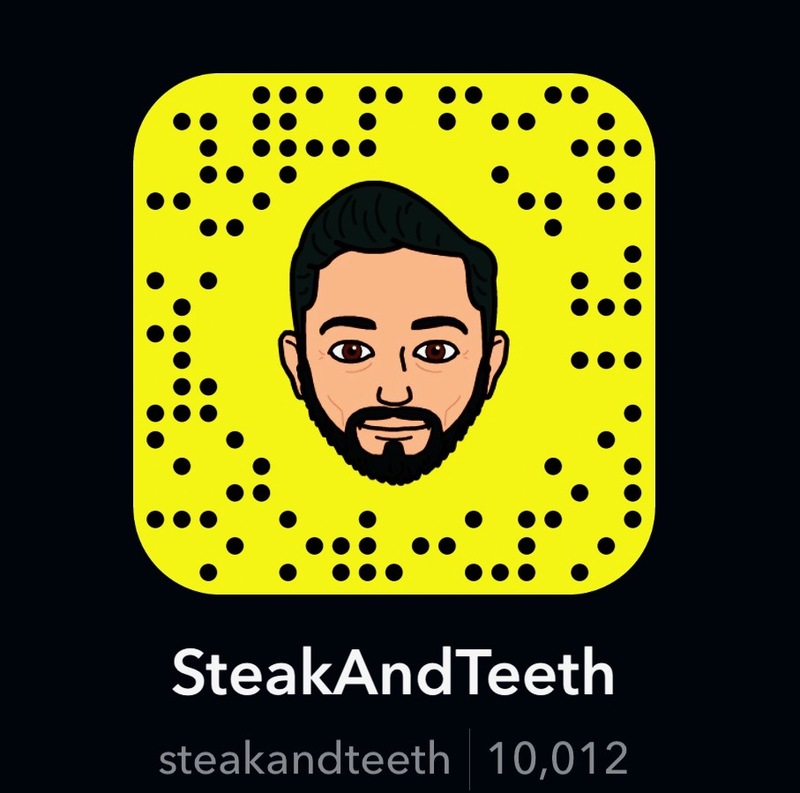 (Needless to say, my friends promptly retracted their requests for free dental treatment). A cloud of steam promptly billowed out, and whilst it did a good job of cleansing my pores, there was a unanimous sense of disappointment that it didn’t singe my unsightly face off altogether. Thankfully, the biryani within was a more alluring spectacle. The soft rice delivered a fantastic amount of heat and boasted a complex layering of flavours and spices. This was pleasantly offset by the accompanying raita, which was topped with chunks of fried okra, providing a fantastically chewy texture. However, whilst the chunks of lamb shank within the biryani were fairly tender, they were also surprisingly bland, and lacked a substantial dosage of seasoning and spice. Were it not for the aggressive kick of the fiery rice and the accompanying salan, the lamb would almost certainly have undermined an otherwise great biryani, and this is one aspect where DUM must take a greater amount of care. Across the menu, starters range from £2-£5.50, drinks cost around £3, and all three biryanis come in at £14.95 each. Relative to the restaurant’s location, the quality of the ingredients, and the volume of the food, such prices are rather reasonable, and you’ll certainly leave with a full, happy belly and a scorched, not-so-happy tongue. What’s more, you can expect to find that the warmth of DUM’s kitchen creations spills over into their hospitality. From the hostess sat by the door to the waiters (and Dhruv Mittal himself) below, every member of staff we encountered provided a warm welcome and an attentive level of service. Short of providing a life-threatening quantity of mithai and an endless supply of chai, it was about as close to a homely level of Indian hospitality as one could expect to receive in a London-based eatery. As for the restaurant itself – it’s not so much a restaurant, as it is a small underground bunker – presumably to contain any internal explosions of spice-intolerant customers. 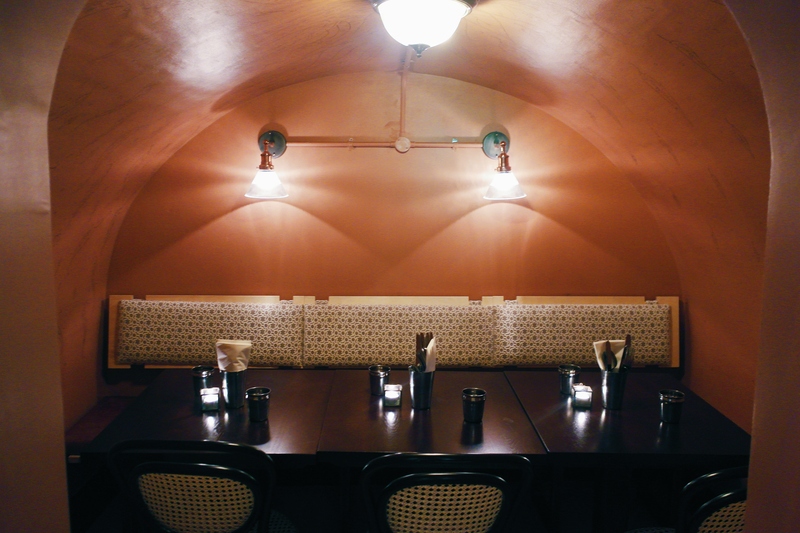 Taking after the rustic food shacks of the Indian subcontinent, the entrance is narrow and inconspicuous, and leads the way into a cosy but spacious underground dining room, with a number of off-shooting private enclaves. 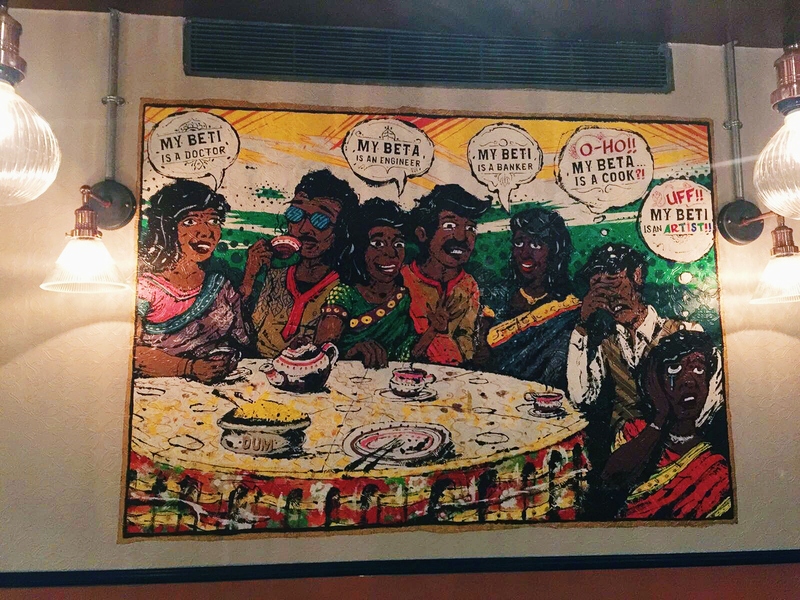 The decor sports a blend of contemporary and colonial styling, and maintains a rather playful demeanour, with wall-mounted cartoons that poke fun at our favourite aspects of South-Asian culture. It’s certainly a rather quirky set-up, and the dimly-lit environment helps to create a rather authentic feel. Frankly, all it would take to completely transport customers to an inner-city eatery in India, is for someone to jam the heating dial on full and flood the restaurant with sweat. DUM can be found a short five minute walk away from Tottenham Court Road station, and public transport is certainly advised. When it comes to the task of producing a restaurant menu, minimalism can often be something of a double-edged sword. On the one hand, having a small menu can place limitations on a restaurant’s potential, and undermine their appeal to a wider audience, whilst on the other, it can create a sense of focus, allowing an establishment to hone their skills in a particular subset of a particular cuisine. DUM Biryani House is undoubtedly of the latter. 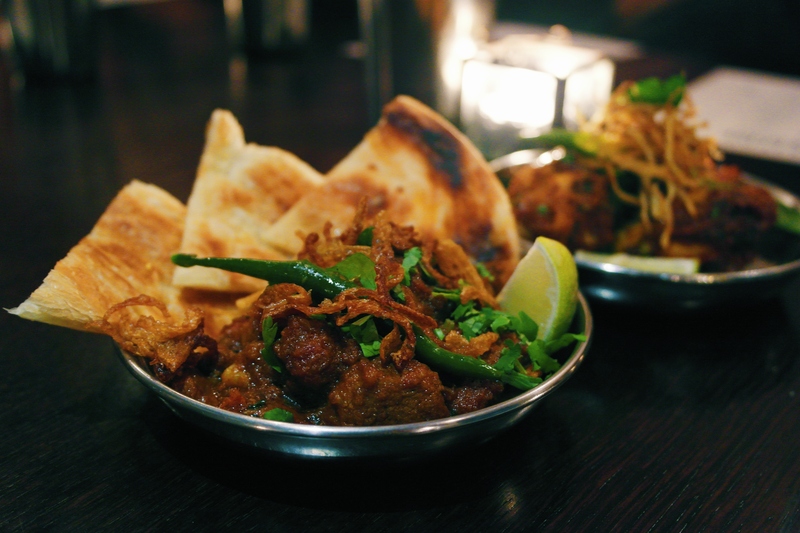 Where other Indian restaurants throw out a flurry of underwhelming plates with diluted spices, DUM plays a tactical game of rope-a-dope, striking the palate with a few well-crafted dishes, and refusing to pull its punches when it does. More importantly however, DUM restores the honourable biryani to its rightful status of glory, giving it the respect and recognition that it deserves amongst the Indian restaurant scene. Of course, some may say that to truly produce a flawless biryani, Dhruv Mittal must first find a way to give birth to a child, and unlock the dark magic of a mother’s culinary prowess. Scientifically, this is a proven fact – (or at least, we’ll pretend it is to avoid getting a smack), but there is no denying that DUM Biryani House does a fair amount of justice to the heritage of the Hyderabadi biryani.